The shortest distance between two points is still a straight line. That's the simple theory behind the Bubba Scrub. The Bubba Scrub is a technique in which the rider throws the bike sideways over the face of a jump, essentially crashing it, and then pulling it back up before he hits the landing. It's been perfected by — and aptly named after — my favorite Supercross racer, James "Bubba" Stewart. He explains the move in this video. 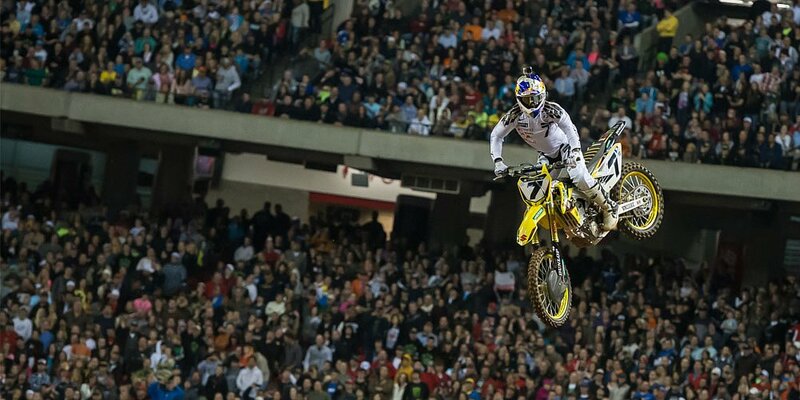 The Bubba Scrub may look like showing off or like it belongs in a Nitro Circus performance more than a Supercross race, but what Stewart is doing here is actually a really big deal. The longer a rider spends in the air during a jump, the more he is decelerating. The Bubba Scrub allows Stewart to straighten the line between the beginning and end of a jump by staying lower to the ground. He's able to get his tires back on the dirt and putting down power sooner. Check out this Red Bull article, which shows Stewart using the Bubba Scrub to pass Ryan Villopoto in a race. While you're at it, read this article on why Bubba is so important for Supercross (yes, at this point I know I'm just being a fanboy, but these videos are seriously insane). Whether you care about new Supercross techniques, dirt riding, or just like watching really pretty motorcycle videos - the Red Bull video is a great watch.